Walter Joyce had a long career in football but it was one that had a delayed start in terms of playing first team football with his debut coming at the age of 22, some six years after he'd signed as a professional with Burnley. Joyce arrived at Turf Moor straight from school in 1953, joining the ground staff at the club and progressing to win his first professional deal just past his 17th birthday in November 1954. He moved through the junior teams and became a regular in the reserves, losing two years due to carrying out his National Service with the RAF at Catterick, but that's where he remained as Burnley lifted the league title in 1960. Joyce celebrated his 22nd birthday early in that Championship season but as Jimmy Adamson received the trophy he was still waiting for a first team debut. When that debut did come it was something of a surprise. Burnley started their defence of the title with a 3-2 home win against Arsenal but the first away game of the season was a repeat of the last away fixture of the title winning season, Manchester City at Maine Road. We couldn't repeat the heroics of just over three months earlier and went down to a 2-1 defeat, but it was the day Joyce made his debut, just 17 days from his 23rd birthday, coming in for Tommy Cummings with Jimmy Adamson switching to centre half. It proved to be his most productive season at Burnley. Once he settled into the side he became a regular at right half. It left Adamson and Cummings vying for the centre half position with Joyce, by now seen as the long term replacement for Bobby Seith, at right half. He might have missed out in the success of the previous season but in winning a place in the 1960/61 season it meant he played in all four of our European Cup ties against Reims and Hamburg, and finally looked set to have a big career with Burnley. Unfortunately it didn't quite happen. For the next three seasons he was in and out of the side and he played in a variety of positions, filling in for players here and there. 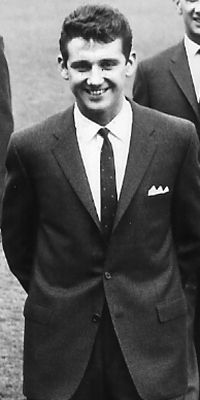 He made just one appearance in the FA Cup run of 1962, deputising for Cummings in the semi-final replay win against Fulham, and by the time we reached the 1963/64 season, with Brian O'Neil emerging in the right half position, he found himself at left back when Alex Elder suffered a broken leg. The stylish wing half with the long throw also captained the reserves throughout this time but, with no prospect of winning a regular place, he opted to move on in February of 1964 and signed for Blackburn Rovers in a £10,000 deal. He enjoyed three and a half years at Ewood Park, if enjoy is the right word, before, in September 1967, signing for his home town club of Oldham where he ended his playing career two years later. That was certainly not the end of his career in the game. Walter remained at Boundary Park on the coaching staff where he worked for four years before becoming manager of Rochdale. He was three years in the hot seat but it wasn't a particularly successful time. In 1977 he returned to the coaching side with Bolton for eight years where, for a time, he was assistant manager and then worked at both Preston and Bolton before joining Manchester United on the youth coaching staff. In September 1999, whilst still at Manchester United, he returned to Turf Moor to make the half time draw in a 3-0 win against Colchester United. After the game he complained of feeling unwell and less than two weeks later he sadly passed away at the age of 62. Burnley manager at the time was Stan Ternent and he said of him: "Walter was a gentleman in the fullest sense who worked with me for four years as youth development officer at Bury. There are a lot of players who owe their opportunity to Walter and my thoughts are with his family at this time. "He was only here at Burnley ten days ago as a guest of the club. Football pales into insignificance when things like this happen. I have very fond memories of him." He might not have had the glittering playing career he hoped for, but he did play top flight football for Burnley and Blackburn, and at Turf Moor played in an FA Cup semi-final and four European Cup ties. But he certainly had an outstanding coaching career that was still ongoing when he suddenly died in 1999. HIs son Warren has very much followed in his footsteps. He too played for Burnley, he too has managed, at Hull, and he too now coaches at Manchester United, working for Sir Alex Ferguson just as his dad did. Walter Joyce was a very decent wing half and maybe he suffered being at a club that, at the time, was one of the best in the country. He had to bide his time as a player and maybe, at any number of other first division clubs of the time, he would have been a first team regular.